It would take a long time to describe, in detail, the life that we lived during our combat in Algiers. I will limit myself to a few important facts about the total sympathy of the people, particularly the devotion of women and young girls. It was the beginning of Ramadan 1957, during the month of April. In a temporary shelter on the rue des Pyramides, I had just finished meeting with Houd, the individual responsible for zonal committees. After he left, I decided to spend the night there. The following day, Djamila went to check out my departure route. She returned, advising me to wait until nightfall. She caught up with our P.C., and sent sister Hassiba back to me, in order to avoid attracting attention to the comings-and-goings of the same person. Around 1:15 PM, Ali, Hassiba and I were seated around a bomb hidden in a camera case that I had to plant that afternoon. Suddenly, a veiled woman burst into the room. Seeing us, she stopped, surprised, and mechanically drew back her veil, revealing an astonished male face. It was Dahmane, the mason. His first words were an apology for his involuntary intrusion, for he was unaware of our presence in his usual hideout; then he calmed us down by assuring us that he was certain he had not been followed. Dahmane’s story was a real-life script. In addition to his profession, Dahmane the mason was a liaison agent between armed groups and a transporter of arms. While we were waiting for him, he had fallen into the hands of the military police. Brought to a Moorish café on the rue de la Lyre, transformed into a torture chamber, he was subjected to “questioning” for five hours. Left lifeless with other interrogated “suspects,” he succeeded in undoing his bonds and in crawling, naked as a worm, taking advantage of the paras’ inattention to seize a machine gun hanging on the wall. The volley of shots scattered his torturers, leaving the door open for him to vanish into the night. At one o’clock in the morning, he was taken in by a family on the rue de la Grenade. His escape was the reason why his house, where we were hiding, was searched. All of the tenants were beaten without results. We imagined the paras’ unexpected achievement of discovering important “prey” while searching for a liaison agent. Our salvation that night was due to the stoicism of Dahame the mason. The following day he met with Ramel and gave him the machine gun. Three days later, disguised as a Moorish woman and armed with a pistol, he decided to return to his habitual refuge, the one where we were hiding. Relaxed, he finished his story after removing his disguise. A few moments later, our hostess came to warn us: the quarter was surrounded! In fact, zouaves had already overrun the house. In the Ghorfa on the first floor, we prepared to fight. Just when the sergeant and his men were about to enter our hiding place, Ali and I opened fire: two dead, the sergeant and a corporal, and three wounded. Our companion, who knew the neighborhood well, called to Hassiba, showing her an opening in the wall leading to the ras of a neighboring terrace. They passed through first, then Ali and I followed, bringing the action to a halt. The military machine was already in place. We had barely crossed the first terrace when a hail of bullets began raining down on us. Hassiba’s billowing pants were shot through several times, and I was wounded on my scalp. Ali and Dahmane, unharmed, went in the opposite direction. I later learned that Ali-la-Pointe had succeeded in breaking through the cordon and was crossing the streets of the Casbah, machine gun in hand, amidst the cheering of Algiers street urchins. Spontaneously, the children had the presence of mind to make themselves useful by serving as scouts for their heroes. Hassiba and I remained in the cordoned area. Despite the rattle of exchanged gunfire, the terraces were overrun with women and children who, with great temerity, were witnessing what had become an almost daily show. I still wonder how the fighting stopped. I specifically remember the human belt forming a protective shield. From everywhere came cries, ululations, advice to show us the way to shelter from enemy fire. I remained immobile for a moment, as if hypnotized by the charm of this powerful demonstration of solidarity in action. Despite her insistence on sharing the same danger, I left Hassiba in the hands of friends. Finally, I arrived by overhead route at a house on the rue du Lion. The tenants welcomed me, happy to help a moudjahid. I washed myself quickly. Coffee was served, but I refused it out of respect for the rules of Ramadan. But the women who surrounded me reminded me that Islam is a tolerant religion, allowing for the breaking of a fast. I had virtually no ammunition; a young man agreed to carry a message and returned accompanied by Zohra and Djamila, who supplied me with cartridge clips and two grenades. All three had succeeded in passing between the barricades encircling the quarter. Then there was another warning. Swarming with soldiers, the street changed color, taking on a greenish hue. I wanted to try to leave by the terraces, but a brave mother stopped me by showing me a more efficient method for our immediate safety: the well, whose lid she lifted. With the help of a ladder, we descended, the sisters Zohra, Djamila and myself, to the bottom of the tank, sliding at the bottom of an underground gallery, with water up to the waist. Just in time. The cover replaced, the besiegers were on the patio. They inspected the premises, then left to search other houses. “You can come back up,” cried our guardian angel, whose sang-froid, initiative and patriotism made us forget our fear. And all the tenants waited around the well for us to surface, happy to have contributed to the saving of the combatants, their brother and their sisters. Djamila was arrested a few days later, on April 9th. At four o’clock in the afternoon, we were at 13 rue du Nil, in a hideout that we had reached after having escaped from a cordon. I had asked Djamila and Zohra to send messages to Ramel and to others in charge, using different mailboxes. Some time later, her mission accomplished, Zohra returned at the appointed time. Djamila was late, and I was worried. I had asked her beforehand to bring back the newspapers, as usual, but she had fallen within the cordon of an entire quarter of the Casbah and could not get out in time. When she returned, one hour later than expected, I was almost sure that she had been arrested. It was very unfair, obviously, but I had to do something to break the oppressive feeling that had come over me. I wanted a change of atmosphere. At 5:00 AM, I called Hassiba and asked her to go prepare another hideout. She did so, then returned. We prepared to leave, observing the usual arrangements. I gave Djamila my briefcase and she hid it under her billowing pants, attached by a scarf under her veil; I asked her to walk twenty meters behind me. Alilou was supposed to go first, behind our liaison agent, Mahfoud, who served as scout; Alilou would follow five meters behind. Then, following five meters behind, would be Zohra. Then Hassiba. Then myself and finally, I repeat, Djamila, at twenty meters. In the event of an accident, we could turn back and return to the hideout. Our cortege left the hideout and entered the street. Arriving at the first crossroads, we had to turn left. To cover us, Mahfoud, the first in the column, went up the right, watching what was happening in order for the rest or our little group, with Alilou now in the lead, to go down to the left. In fact, Alilou, Zohra and Hassiba passed without difficulty. But at that moment, Mahfoud found himself face to face with a zouave patrol. Hastily, he turned back towards the crossroads to warn us: “Quick, quick, the patrol!” Since I had just arrived at the corner of the street, I quickly turned left and Djamila sped up in turn. But the zouaves, having seen Mahfoud do an about-face, rushed after him. They cried “Halt!” and, seeing me, shot off the first round. Suddenly, Djamila, who had arrived at the crossroads, instead of turning back, ran into the middle of the street with her arms spread to cover my escape. At that precise moment, I turned quickly, machine gun in hand, to avoid being shot in the back by the zouaves. There was an exchange of fire. Hit by a bullet in the shoulder, Djamila fell, while the soldiers rushed in. I had to fall back without knowing if she was dead or alive and I quickly returned to the hideout, where Hassiba was already waiting. I immediately called the owner to try to find out what had happened to Djamila. He went in search of news, and learned that she had been brought, wounded, to the Police Station in the 2nd arrondissement. I immediately returned to the hideout where Ali and Ramel were waiting and we organized a plan for her escape. But as we were about to attack the Police Station, we learned that she had just been transferred, barely five minutes earlier, to another location. All of the F.L.N. intelligence services were already on alert, tracking Djamila: Mustapha Hospital, Maison-Carrée, Maillot Hospital. But these transfers were so rapid that, each time, our units arrived a little too late for the information to be used. Djamila received the message but refused. She said she did not want brothers to be risking their lives to free her. But I was determined to try anything to save her. I also wanted to show the enemy that, despite the blows to which we had been subjected, an organization still existed that was capable of acting. Through the intermediary of a brother from the hospital, I decided to contact the chief warrant officer who, because of his responsibilities at the Maillot hospital, was able to go anywhere and who seemed sympathetic to us. But how could we convince a French Army non-commissioned officer to help us? “Invite him to your place for a baptism,” I told the brother. And we orchestrated a whole scenario. The chief warrant officer arrived with the nurse in a house on the Lavoisier impasse (a house that Djamila knew well. But, certain that she would not talk, the brothers did not want to leave it.) They sat down in the room and began to chat. All of a sudden, the door opened. Instead of the expected couscous and coffee, it was Ali himself who entered, looking fearsome: black velvet shirt, green tie, velvet pants, MAT 49 machine gun in hand and two grenades on his belt. The warrant officer stared wide-eyed, dumbfounded, when Ramel entered next, dressed in blue, also armed with machine gun and grenades. Finally, it was me, in blue jeans and brown sweater, with the same gear. Seated on his wool mattress, the chief warrant officer turned white. He believed his final hour had come. I sat down next to him, with Ali and Ramel opposite us. “I didn’t do anything,” he groaned, and he began to tell us his life story. Delighted by his good attitude, we brought in the coffee and explained what we wanted him to do: give us a map of the Maillot hospital and help us, from the inside, to enable Djamila to escape. He immediately agreed and we began the preparations without delay. In the days that followed, I used Zohra Drif as a liaison agent with all of the men responsible for this mission. The chief warrant officer had made his car available to us, which enabled us to make a tour of the hospital grounds in order to become familiar with the recreational grounds before the capture date. He also gave us military uniforms that he had taken from his barracks. In short, everything was ready for the operation. At the appointed hour, at 10:00 AM, three fidayine were to enter the hospital, put on the military uniforms and wait for the evening. Alerted by message, Djamila, at 9:00 PM, was to ask a nurse for a pill. At that moment, the brothers would appear and take her away, without any rough stuff. Everything took place as planned, until the last minute. Until the last half-hour, to be exact. At precisely 8:30 PM, an entire battalion of paras burst into the hospital and, under the very eyes of the fidayine responsible for freeing her, had Djamila brought out to put her on an army truck. I believed, that day, that I would never see her again, But since those dark days, I have never forgotten the courage of the chief warrant officer, who had risked everything in order to help us. And he did not stop there. He began to supply us with drugs, then to supply the maquis, until the day he was arrested and sentenced to several years of prison. Meanwhile, the unexpected reoccurrence of armed actions and bombings quickly brought the entire parachute division back to Algiers. The pressure put on Willaya IV was thus relaxed. But the repression of Algiers was more savage than before. For the third time, the organization was seriously affected. But the spirit of the Algerian Revolution remained alive within the heart of this persecuted people, whose hidden heroes counted among the tens of thousands. This collective spirit, invincible, was nourished by the sacrifice and the blood of martyrs like Ali-la-Pointe, Ramel and so many others. I need only give a quick account of the life and struggle of one of these heroes. of schooling to him forever. Like many uneducated Algerian children, he was obliged to look for work at the same time that some of his friends were barely beginning to study their first school books. He never failed, whenever the occasion arose, to cast a look of jealousy and regret on any school from which the voices of children reciting their lessons or singing in unison a song from our childhood could be heard. He was aware of having lost a great deal, but his bitterness abated with his resolve to learn and to try to become better. He was also proud of the idea that his sacrifice had made it possible for him to help his father meet the daily needs of a family of seven children, of which he was the eldest. At seventeen, he became interested in sports and, specifically, in boxing. He lived in la Pointe-Pescade, a nearby suburb of Algiers, which is why he was called Ali-la-Pointe. He participated in many boxing matches, including several amateur bouts much appreciated by the public. But the extreme modesty of his family’s social condition intervened, once again, and prevented him from devoting himself entirely to a sport that he loved and for which he obviously had real talent. Leaving one job for another at the whim and mood of his boss of the moment, he became a mason and, with time, was able to develop his skill in this profession. However, unable to stand the constant harassing and daily injustices of a racist foreman, to which he and his comrades were subjected, he was immediately let go. He found himself once again in a position that was already too familiar to him: he was unemployed. That is when, in spite of himself, he became what is commonly known as a bad boy. Frequenting unsavory locations, in which he lost no time establishing his authority, he quickly became viewed as someone who was tough, but also proud and of a nobility of spirit so high that he foreswore the slightest despicable act. Thrown into this environment by the extremely restrictive social conditions of an existence without happiness or hope, he nevertheless remained true to himself. Drafted, he refused to serve. Hunted by the police, he was arrested shortly thereafter and did his military service in a barracks in Blida. Upon his return to civilian life, he once again frequented the questionable locales of the Algiers underworld, where he was still feared and respected. Having participated in a real shoot-out at the end of 1954, he was arrested and incarcerated in the Barberousse civilian prison in Algiers. At the time, many Algerian patriots were already held in this prison. Upon meeting them, Ali quickly understood the profound reasons for all the injustices already suffered, the real reasons for unemployment, poverty, illiteracy and repression in all its forms. He quickly discovered the sole source of all of these evils: French colonialism. Plunged each day into heated discussions with hardened militants, he came to understand the necessity of armed conflict to defeat the colonial regime as a prior condition for a worthy, free and happy life. His faith in the Algerian Revolution and in its ultimate triumph was, for him, almost instantaneous. His life now had a purpose, a hope. Discovering the magnificent solidarity that existed between all the militants, he understood that the Algerian people were a whole and that they had to fight together for a common purpose. He understood right away that the best would have to accept the supreme sacrifice for a cause that was this noble, this just, this exalted. Burning with desire to participate without waiting any longer for the gigantic battle of the Revolution, he tried to escape from Barberousse. This first attempt at escape was a failure. And yet he did not despair. After being sentenced to four years in prison and his transfer to the Berrouaghia penitentiary, he carefully planned a new escape. Assigned to hard labor in the Damiette yards, he tried to elude the surveillance of the guards and to escape. He managed to reach Algiers and tirelessly sought to make contact with the organization, while leading an underground life. Many police doggedly pursued him and occasionally managed to find his trail. But each time, he managed to extricate himself by means of small, armed shoot-outs. I met him for the first time towards the end of December 1955, in the heart of the Casbah of Algiers. 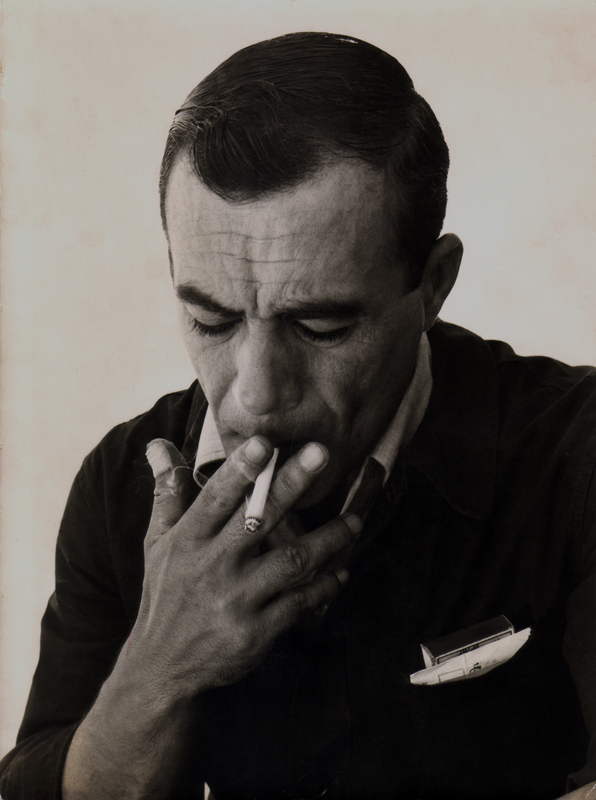 He was a handsome, dark man, built like an athlete, who, without grand phrases, told me of his calm resolve to fight and to die for Algerian independence. His first armed action within the ranks of the soldiers without uniforms of the A.L.N. took place at the beginning of 1956. It was directed against a police informer and was crowned with success. This confirmed my first impression that I was truly dealing with a member of the elite. I decided to take him with me and set him up in my own hideout. This hideout was located on the rue des Abderames. The police were already looking for me. Ali’s presence contributed to the reinforcement of security conditions for our small group of leaders. It was Ali, in fact, who first suggested the idea of a rigged passageway that would enable us, in the event of an alert, to quickly reach the terraces of the houses located close to our refuge of the moment. This idea was often put into practice and, very often, using it enabled us to escape and thus saved our lives. At those times, Ali remembered all of the techniques of his former profession of mason. Always in the forefront of the action, he multiplied acts of bravura with extraordinary courage and audacity. Success awaited all of his actions. Only a few were unsuccessful. For example, there was a garage located on the boulevard Saint-Saëns in which a number of military vehicles were kept that was to be set on fire. In fact, when it was my turn to enter the garage, I heard a loud shot. It was Ali, who had inadvertently set off his 11.43 while trying to calm and reassure the night watchman, who was trembling with fear and whose life absolutely had to be saved. It was one o’clock in the morning. The sound of the shot woke up people in the quarter, many of whom appeared on their balconies to cry and thus give the alert. Not wishing to create useless victims, we quickly retreated and were able to get back to our hideouts. Another failed attack was directed against the evil executioner Achiarry. This attack had been decided upon at a meeting held in a shack that we were using as a hideout, at my place in the Casbah. Our information services had just obtained proof that Achiarry was one of the main directors of the ultra network in Algeria. This did not surprise us because, for a long time, each of us had already identified Achiarry as one of the most hated enemies of our people. Each of use remembered the criminal role that he had played during the May 1945 massacres, which cost the lives of tens of thousands of Algerians. The decision had been made and the conditions for its implementation were jointly determined in another hideout located at the Rovigo turn. Three men, including Ali-la-Pointe, were assigned to carry out this mission. On the appointed day, they got into a car that took them to the boulevard Saint-Saëns, right near Achiarry’s residence. Upon their arrival, they noticed that the intended target was not at home. It was eleven o’clock in the morning. Ali and his two companions, Hamadi and Salay, decided to wait in the street for his return home. But, after waiting for half an hour, the designated target, contrary to his usual habits, had still not appeared. Suddenly, the street was swarming with police. Cars and motorcycles were heading straight towards Ali and Hamadi, trapped in a kind of impasse. The barrels of the machine guns were already three meters away from our two fidaï. Keeping his cool and with disconcerting speed, Ali aimed his pistol and opened fire on the assailants, who immediately threw themselves to the ground. Taking advantage of the moment of confusion caused by his audacious reaction, our hero managed to escape, all the while exchanging fire with the police. He was able to reach the car and miraculously escaped. Salah also succeeded in getting away. Hamadi, on the other hand, was arrested. The chase through the streets of Algiers was very rough. The exchanges of fire continued until Ali managed to shake off the cars that were chasing him. This action, despite its failure, confirmed Ali’s exceptional value to our people and, at the same time, earned him the disturbing hatred of all the colonialists. From that point on, policemen trembled at the very idea of one day being assigned to arrest Ali and our little group. Our capture was considered one of the major objectives of the colonialist apparatus. But since the Casbah had become, thanks to the organization, a real maquis as impenetrable as our djebels of Kabylie or Aurès, they decided to create “counter-terrorist” groups, made up of natives, in order to attempt to destroy our networks. In fact, the ultra directors and the police called upon the most degenerate Muslim members of the criminal underworld of Algiers. They succeeded, with difficulty, in recruiting a few. One of them, Abdelkader Rafaï, known as Bud Abbot, a notorious pimp, was particularly zealous in this sad “task” in the service of the police. It was he, among others, who planted a bomb in the home of a Muslim doctor known to have F.L.N. sympathies. His misdeeds no longer mattered. His arrogance and his contempt for people were evident. He believed that the protection of the colonialist apparatus made him invulnerable. F.L.N. justice had condemned him to death, and Ali claimed the honor of killing him. He was given the assignment, and brother Arbadji Abderahmane was to assist him. Once the necessary information was obtained and organized, it was made available to Ali. The execution date was set for March 29, 1956. That day, on the rue Héliopolis in Algiers, Abdelkader Rafaï was dining with several individuals as contemptible as himself. It was during this meal that Rafaï and his terrorized friends suddenly saw Ali and Arbadji materialize in front of them. Rafaï’s cowardice was sadly plain for all to see. 1.Confiscation of all individual weapons to enrich the stock of the A.L.N. 2. Elimination of drug traffic (cocaine, opium, kif, etc.) in order to preserve the health of our youth. 3. Elimination of gambling and of the ignominious exploitation of prostitution, while waiting for the conditions for the final elimination of this scourge of society to be created at a later date. 4. Selection, in order to identify those who are still healthy, redeemable and capable of voluntarily accepting the hard sacrifices of the fight for national independence. 5. Information, fundraising and the provision of secure hideouts. All in all, these objectives were largely achieved, although most of the criminal elements were kept outside the Organization itself for legitimate reasons of security. It is worth noting that a large quantity of individual weapons were given to the Organization. Those, very few in number, who refused to bend themselves to the will of the F.L.N. by continuing their “work” of informing for the police were liquidated without pity. This was the case, for example, of one Medjebri known as Lemdani, who ran a Moorish café on the rue Randon. There, also, it was Ali who intervened, at the head of a small group of commandos. Medjebri and two of his assistants were the sole targets. When Ali burst into the Moorish café, there were already a large number of customers. In spite of this, Ali directed his fire with remarkable precision and succeeded in hitting only the three intended targets, avoiding making any innocent victims. Following each of these brilliant actions, he was aware of having achieved a double purpose. On one hand, he eliminated a stealthily efficient enemy of the Organization; on the other hand he freed the residents of the Casbah, many of whom, out of fear, were also the daily victims of the often brutal behavior of these police auxiliaries. His love for the people was evident at all times and everyone knew it. He merited, in particular, the unanimous gratitude of the residents of the Casbah on the day he executed a police agent named Sahraoui. The latter was a zealous policeman who participated in the torture inflicted on patriots and who, on his way home, would amuse himself en route by overturning the stalls of ambulant merchants and crushing their merchandise. He was even more odious the day that a patriot, after fierce resistance, was killed near his home. In order to demonstrate his zeal to his colleagues and superiors present, he came out of his house in his pajamas, revolver in hand, mouth full of insults, to place a final bullet in the head of a patriot who had already died during the fighting. When Sahraoui’s execution was announced, Muslims congratulated each other in the street as if it was a holiday. Ali’s love for the people sometimes manifested itself in particularly moving ways. Here is one example among many others. We were supposed to hold an important meeting. It was decided that it would take place in a previously unused location. The militants responsible for the material organization of the meeting quickly found a patriot who said he was willing to receive us. When we were supposed to arrive, Ali accompanied me. Our host, Amar Blis, was waiting for us outside the front door. The other brothers were already inside. We climbed a narrow, poorly lit staircase. Reaching the top, our host told us to duck, in order to pass through an opening approximately one meter high and to finally enter our “room”. We followed his instructions and entered the “room.” Immediately to the right was a small, extremely narrow corridor, approximately two meters long, ventilated only by a kind of small natural porthole. We were facing a rather large hole, imperfectly hidden by a piece of old cloth of indeterminate color. We quickly learned that in this hole – utilized as a kind of second “bedroom,” – were the wife and numerous children of our friend. The air was unbreathable and the odor unbearable. We became nauseous. I had never before seen this type of atrocious misery. Ali had tears in his eyes. He could not stand to see such a sight. He did not understand how human beings could live in such conditions. He made a suggestion on the spot and I agreed. It was simple: we would have to extricate these patriots from an awful situation by buying a small house in the Casbah and giving it to them. And that is what was done. A few days later, the keys for a modest house consisting of three small rooms, a kitchen, and a sunny terrace were given to the unfortunate brother who could not believe his eyes and who cried with joy. This insignificant event considerably strengthened the authority of the Front among all of the little people of the Casbah. And to our great surprise, since we ourselves had revealed nothing about this act of simple human solidarity, everyone knew the circumstances under which the family of brother Blis had changed residence. Everything was known, including our involvement, the involvement of the F.L.N. Arrested a few months later in the context of his ordinary activity as a militant, brother Amar was horribly tortured over the course of several days and nights. His torturers wanted to make him reveal the address of my hideout and that of Ali-la-Pointe. He demonstrated superhuman courage and told the police that he would prefer to die rather than to denounce us. In all these circumstances, Ali, greatly moved, felt surrounded by the warmth and fraternal affection of the people. Nothing could give him greater satisfaction. He constantly honored this confidence by delivering ever greater blows to the enemy and its supporters, up until the day he himself fell, his weapons in his hands. He died with the certainty in his heart of an Algeria that would soon be free and independent. An Algeria in which misery and exploitation would no longer exist. He gave his life for a sovereign Homeland, in which the people would be the sole masters of their destiny, a nation in which citizens of all origins would be equal and brothers, and in which the arbitrary and dictatorship in any form would never be established.A modern Algeria, concerned with justice and peace in the Maghreb, in Africa and throughout the world. Such was Ali-la-Pointe: a hero, a patriot, a man! Saadi Yacef is the author of The Battle of Algiers: A Memoir, which he wrote as commander in the Algerian independence struggle that forms the basis of Gillo Pontecorvo’s landmark film The Battle of Algiers. As both producer and actor in the film, Yacef played a central role in creating what is arguably the greatest political film of all time, bringing to the screen the epic battle of Algerians for independence from French occupation. 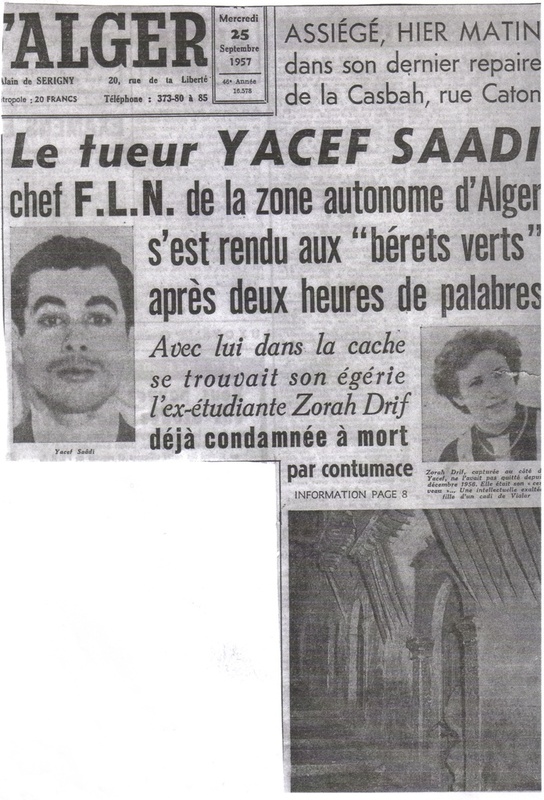 The son of illiterate Berbers from the rural Algerian province of Kabylie, Saadi Yacef was born on 20th January 1928 in the Casbah, a two-kilometre square section of Algiers inhabited by 80,000 residents. He attended school there until 1942 when Allied forces landed and converted the school into a military barracks, essentially ending his formal education. In order to make a living, he began work as an apprentice baker. In 1945, aged 17, Yacef joined the nationalist Parti du Peuple Algerien (PPA or Algerian People's Party). Outlawed by the French authorities, the PPA was reconstituted as the Mouvement pour Ie Triomphe des Libertes Democratiques (MTLD or Movement for Triumph of Democracy) and from 1947 to 1949 Yacef served in the MTLD's paramilitary wing, the Organisation Secrete (OS). After the OS was broken up, he moved to France and lived there until 1952, when he returned to Algeria and again worked as a baker. He joined Algeria's National Liberation Front (FLN) at the start of the Algerian War (of independence) in 1954 and a year later met Ali La Pointe (one of the protagonists of the film, The Battle of Algiers). Also known as Ali Ammar, La Pointe had recently escaped from prison having been condemned to death for firing an unloaded gun at a French policeman. Politicized during his incarceration by his fellow prisoners, La Pointe was seeking to join the FLN and, through contacts he had made while hiding out in the Casbah, he eventually reached Yacef. 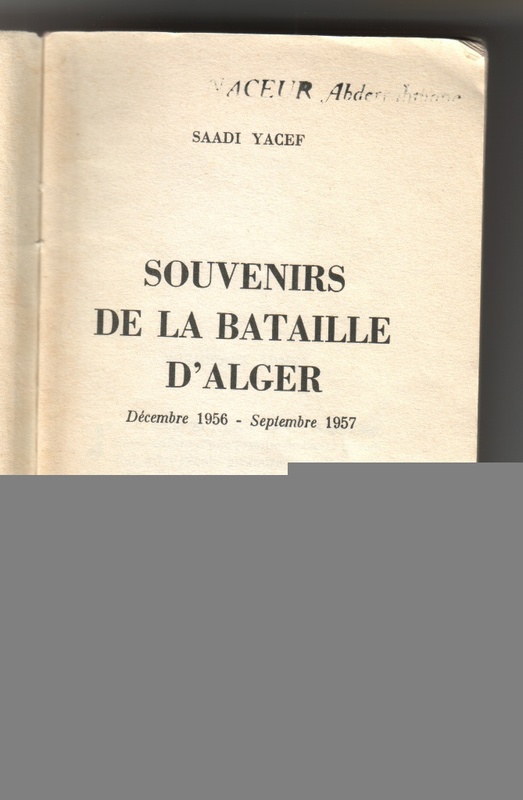 By May 1956, Yacef had risen to become the FLN's military chief of the Zone Autonome d'Alger (Autonomous Zone of Algiers) and, with Ali La Pointe as his deputy, was one of the leaders and key figures fighting on the Algerian side in what came to be known as the Battle of Algiers. Between the autumn of 1956 and the summer of 1957 he organized a series of bombings in public places around the city of Algiers. Following Algeria's achievement of independence in 1962, Yacef was released from prison as a goodwill gesture from de Gaulle. 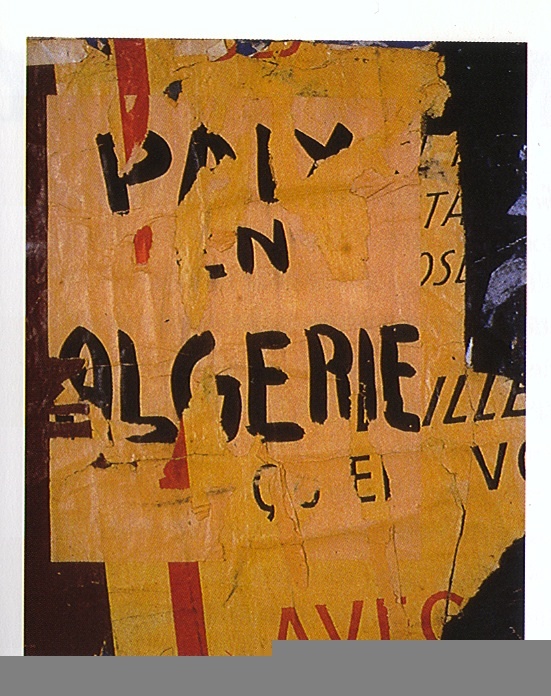 Aided by the new Algerian government, he set up the film production company Casbah Films. Apart from the Battle of Algiers, he co-produced several films including Lo Straniero, Luchino Visconti's adaptation of Albert Camus' novel The Stranger. In January 2001, Saddi Yacef was appointed as a senator in the Algerian People's National Assembly by the President of Algeria, Abdelaziz Bouteflika. Saadi lives in Algiers with his wife of 42 years, Baya. They have five children and three grandchildren.